I was thirteen when I realized I was “fat.” At 5’8” I weighed in at a whopping 138 pounds. Although my mother insisted that I was not fat, but just right, I knew she was wrong. Judging from the three other girls in my family and every girl in my class except one, (Jane Johnson), this was painfully obvious to me. Where they were shorter and smaller and generally “petite,” I was tall and big and muscular and, well, fat. And so I began my 17-year diet career. My first attempts to lose weight were simple and not too long-lived because I couldn’t tolerate going hungry very well and my “diets” were quite extreme. After nearly fasting all day, I’d find myself eating nearly a half-gallon of ice cream before bed. Later diets were more sophisticated and I did lose weight at times. In fact, I’ve lost hundreds of pounds, only to regain them when I couldn’t stay with the latest diet program. Eventually, my weight was fluctuating over 50 pounds and my life was out of control. I had two problems to solve; my weight problem, and a problem that had become more serious and debilitating—my lifestyle as a chronic dieter. I realized at this point that I didn’t need another diet—I needed a solution. Dieting as a way of life had become an obsession and I wanted to be free of this obsession. I wanted to be able to eat like a normal person. I wanted to be “naturally thin,” but I didn’t think it was possible for me. I had been at war with my body for too long. The stimulus for fat accumulation is famine — going hungry, eating “late,” eating too little, eating poor quality food. So I began to study obesity. I read many research studies in medical journals as well as articles published in popular periodicals. They all approached the topic from the same perspective: “Overweight people eat too much and exercise too little, so the solution to being overweight is to eat less and exercise more.” Well, I had believed this notion and had tried for nearly seventeen years to do what they were recommending, but it never led to lasting success. I decided to do my own research. I asked people about their eating and their dieting and their weight struggles and their family weight histories. I talked to overweight folks, and underweight people, and normal weight people, and people who couldn’t lose weight no matter what they did, and people who couldn’t gain weight, and people who lost and gained like a yo-yo. I learned many fascinating things from all this talking, but one fact emerged that changed my life forever. It is this: At some point in any traditional, restrictive diet, 98% of dieters lose control of their eating. This fact fascinated me, because I, too, had lost control of my eating many, many times. I knew the people I talked with were not making it up. I knew they really did lose control. Well, if dieters lose control at some point, I asked myself, what is in control? What is more powerful than my desire to lose weight and be thin? Only one answer came to me; my survival instinct. As I pondered this, more questions came: Why do dieters lose control of their eating? What is it about dieting that triggers the survival instinct? Why do dieters typically overeat and regain weight they’ve lost by dieting? What role does heredity play in the development of obesity? What about eating disorders and the survival instinct? Gradually the pieces of the puzzle began to fit together. The scientific concept that helped me understand how the survival instinct relates to weight problems and disturbed eating patterns is the Theory of Adaptation. This theory simply describes how different species adjust to changes in the environment in order to survive. The examples of adaptation in humans are many. We retain fluid when we take in too little as an adaptive response. We produce more hemoglobin when we move to a high altitude to compensate for the poorer oxygen concentration in the air. That’s adaptation. As I applied the principles of adaptation to excessive weight gain, I discovered that we also adapt to changes in food availability. When humans experience times of famine, they burn fat and muscle tissue to survive, and when food becomes more plentiful, they recover this fat and muscle and may add extra fat to protect against future famines. This is necessary in any environment where the food supply is uncertain. It doesn’t matter why a person goes hungry or eats poor food or too little food, the body naturally adapts. The next questions led to my recovery: If bodies adapt to famines by accumulating protective fat, how do I stop this adaptation from happening? Remember, the stimulus for fat accumulation is famine—going hungry, eating “late”, eating too little, eating poor quality food. This includes traditional, quick weight loss diets. If I stopped dieting, stopped going hungry and trying to eat less all the time, and instead concentrated on learning how and what to eat, I thought I might get different results. This wouldn’t be a months-long program, it would be a years-long shift and would have to last the rest of my life. Could I live with eating well consistently and never going hungry? Could I really give up the diet lifestyle to which I was quite addicted? It did take months, just to tune into my hunger and eat every time I got hungry. I had to learn to take food with me because I found that I became hungry at very inconvenient times where no food was available. Avoiding famine was my focus. I stuck to very high quality food—no junk, no desserts, ever. I didn’t weigh myself because that made me worry and tempted me to go back to controlling my food intake artificially. Gradually, over four years my weight leveled off and stayed stable for two years. I figured that must be my “ideal” weight because that’s where my body stabilized. I was surprised that I weighed in the 140s. I had thought I would end up at 120 as a “naturally thin” person, but I soon realized that that weight is unrealistic for me. 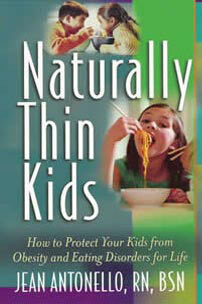 I have been naturally thin for over 25 years. I eat well and never go hungry, I don’t diet, I never worry about my weight, my clothes always fit and I like my body. 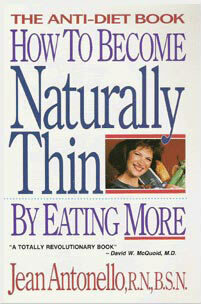 My research and my own recovery inspired me to write How to Become Naturally Thin® by Eating More. It was first published by Heartland Books and again in mass market by Avon Books. The idea of eating more and losing weight back then was preposterous, certainly to publishing companies, so it took a while to get it into print. Anti-diet ideas have gained ground since, but I have yet to see another book that suggests that overweight people can actually trust their bodies to lose weight. I noticed that among those I taught and coached, many people with eating disorders were doing very well in recovery. In fact, they seemed, on the whole, to be doing better than those with a simple yo-yo diet history. 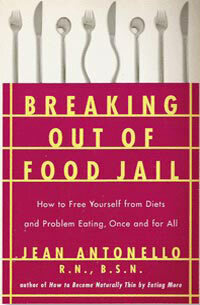 This encouraged me to write a book focused on disturbed eating patterns, Breaking Out of Food Jail, which was published by Simon & Schuster. I have had the pleasure to personally witness many recoveries, and to hear reports of recovery from people all over the country, and even other countries. 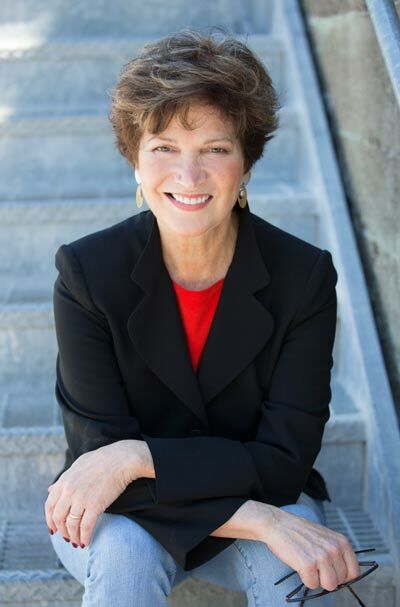 These grateful individuals have recovered not only their bodies, but their self-esteem, their energy, their confidence, their pleasure in life, from learning about how their bodies work and by applying the Naturally Thin® principles.